The Penguins GOALS Foundation 50-50 Raffle is held at every home game during the Penguins preseason, regular season and playoffs. Tickets are sold at the team’s two kiosks on the concourse, as well as by sellers with mobile ticket devices. Sales start at the time the gates open until the end of the second period, with the winning number being announced during the third period. For a list of past winning numbers and take home amounts, click here. 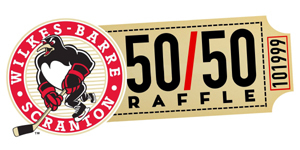 For complete rules on the 50-50 Raffle, click here.